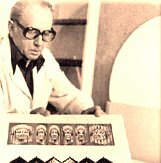 Jiri Kolar is among the most influential and well known Czech artists of the 20th century, famous for his collages and novel art techniques. This dedicated page contains 3 parts: 1) A brief biography. 2) A list of books by or about him that are available through online bookstores. 3) Links to some of his images and more information. Jiri Kolar was born on Sept 24 1914 in Protivin, CZ; since 1980 lived in Paris; after 1989 has been returning to his homeland and lived in Prague, CZ where he died on August 11, 2002. Co-founder of Group 42. His early works are represented by traditional poetry compositions. In 50s his poems begun to reach out to visual realm and various media. 60s are characterized by geometrical abstraction, visual poems and technical objects. He is most famous for his collages and innovative art techniques - chiasmages, rollages, froissages, etc. Images: Galerie ART, Galerie Online, ArtNet, Worldwide Arts Resources, La Nouvelle Revue Moderne, Der Standard, Galerie Ernst Hilger, Metropolitan Museum, Pavel Zoubok Gallery, Ubu Web, Passauer Medienzentrum, Galerie Krause, Musée Typoésie.